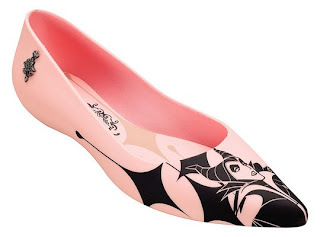 Ever heard of Brazilian shoemaker Melissa? Well, I hadn't until I stumbled across these cute little Disney flats but, apparently, most of the world has. The thirty year old company creates eco-friendly plastic shoes designed to be easily broken down and recycled. Most are made out of a particular plastic that molds to your feet, are breathable and hypoallergenic. The company has also partnered with a number of designers including Vivienne Westwood and Jean Paul Gautier. The plastic shoes have recently started popping up at red carpet events sported by Katy Perry, Anne Hathaway, Cate Blanchett and others. The best part is that the Disney Villains flats aren't the only super-geeky line from Melissa. The shoemaker also has Snoopy and Smurfs kicks. 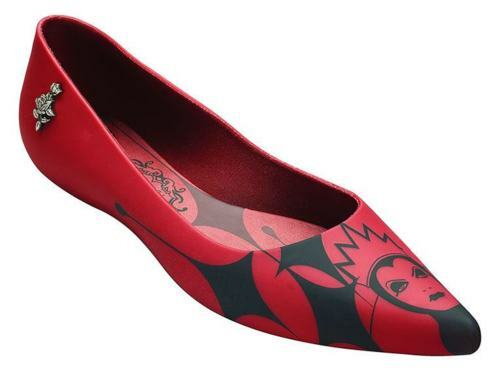 View the Ursala, Evil Queen and Cruella DeVille styles and find out where you can buy 'em in the States after the jump! Those are all super cute - and priced about 3 times higher than I'd pay for them, for sure. 30 bucks, yes. 100? No. I wonder what gives. Yeah, all their shoes go for that or much higher, from the looks of it. I wondered if it was because of the materials or maybe the cost of labor. Melissa has a number of really cute shoes shown on their site. I'd worry that the plastic would cause blistering but, with their extremely popularity, they can't be too bad. I have a couple pairs of Melissa Shoes, and I can vouch that not only are they ridiculously comfortable (no blistering on sockless-feet), but worth every penny. They aren't plastic, like those old school jelly sandals, they last forever! !